I’m back! Praise God for 24 hour bugs that are over quickly! Since I missed a day outside, I had a bit of catching up to do this morning. I needed vegetable broth for my dinner recipe, so I started out by trying my hand at it first. Oh my, is it easy. I had no idea. I will never pay $3.50 for a box of this stuff again! We had been saving vegetable ends in the refrigerator in a baggie all week, so I just dumped them with a few more chopped up carrots, a bit of onion, some pepper, and a bay leaf into a big pot of water. I covered it and put it in my solar cooker for the morning and by lunchtime I had wonderful smelling broth. Just strain out all the vegetables and the bay leaf and enjoy! Next I tried tortilla soup. This is another Rip Esselstyn recipe, and I love it. The fire roasted tomatoes are key. Combine all ingredients, stir and solar cook covered for about 2 hours. Top with avocado and crispy tortilla strips. 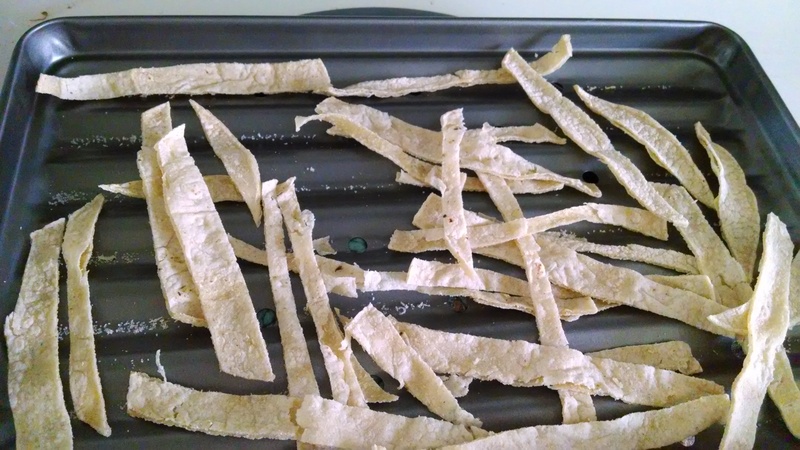 Now the crispy tortilla strips are really the best! I ate a ton of them yesterday. Just cut a tortilla (Gluten-free, of course) with a pizza cutter and then place on a baking pan in the solar cooker for about 45 minutes. Add a bit of salt if you like. They are crunchy and fabulous! Rating: double yummy! Definitely will do this again, and the soup easily makes enough for 2 meals!